For as long as I can remember, Sophie has loved to talk on the phone. She can certainly hold down her end of a conversation, if she’s the topic. But lately I’ve noticed a sea change. Sophie is engaging with the person on the other end of the conversation in ways I’ve never heard. 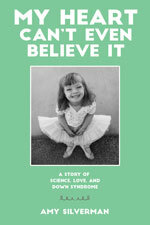 For years I’ve hovered in the background and stage-whispered, “Ask, `how are YOU, Aunt Jenny?’” or “How was YOUR day, Papa?” and suddenly — it feels like overnight — she’s doing it herself. She’s asking questions and she’s interested in the response. She hasn’t mentioned it or acted like she’s noticed, but from my perspective it’s a new chapter for Sophie, an important sign of maturity. Apply it to text messaging, and — wow. This weekend we drove to Flagstaff to spend the night at my parents’ house. 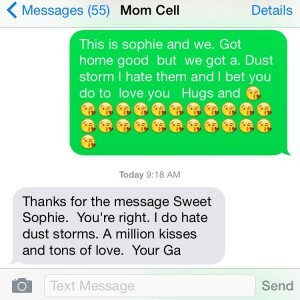 I promised my mom we’d let her know when we arrived home safely, and crashed on the couch before remembering I hadn’t called — so I asked Sophie to do the honors. This morning I picked up my phone and found the exchange posted above. 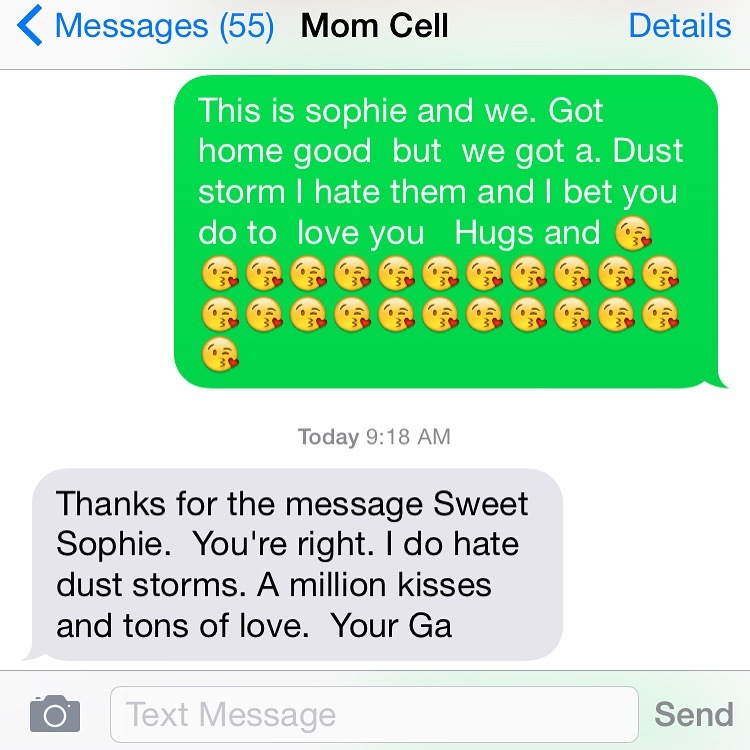 She didn’t just tell my mom there was a dust storm, she engaged her, predicted her feelings, and wrote about it pretty darn eloquently. I never thought a text message could elicit such pride. That’s a victory. Sharing your pride.